A Virtual Expansion released on 2018-12-28, containing 11 new 1E cards. The Trill are one of the most interesting species in Star Trek lore, and Equilibrium is all about the most famous Trill: Dax! Originally born in 2018, Dax has been hosted by nine official hosts (and two extra), and these nine (9) new First Edition cards are all about Dax. From Lela, the first Dax host, to Jadzia's wedding to Worf, you'll find cards covering the spectrum of the lives of Dax. Celebrate the Trill with Equilibrium, available now from The Continuing Committee! A Virtual Expansion released on 2018-11-09, containing 10 new 1E cards. If you're a fan of the Delta Quadrant, then The Gift is just for you! Featuring nine (9) new First Edition cards all focused around decks based in the Delta Quadrant, The Gift contains new equipment, personnel, and missions for your favorite decks. Though this expansion may be small, it's packed with fun and exciting options for your Delta Quadrant adventures. From all of us at the Continuing Committee, we hope you enjoy The Gift! A Virtual Expansion released on 2018-06-29, containing 29 new 1E cards. Return to the Next Generation with Coming of Age, a twenty-seven (27) card virtual expansion for First Edition. Featuring eighteen (18) new and nine (9) reprinted cards from Star Trek: The Next Generation, this expansion adds new personnel and new options for your favorite TNG decks. There's never been a better time to pick up or return to the game, so dig out your favorite cards and build new decks with Coming of Age. A Virtual Expansion released on 2018-05-04, containing 65 new 1E cards. From the Starfleet Academy to the exhibit of a futuristic museum, there is plenty to explore within the sixty-three (63) cards of Metamorphosis. Inspired by popular backwards compatible cards, Metamorphosis delivers new content for a new era of First Edition. Inside, you'll find tools for decks both familiar and new, ranging from mission solvers to capture to battle. It doesn't matter if your aim is survival, glory, acceptance or dominance, you'll find something in Metamorphosis! A Virtual Expansion released on 2017-12-01, containing 10 new 1E cards. Celebrate Earth's holiday season and the 10th birthday of The Continuing Committee with Warp Pack: Holiday 2017! Nine (9) new First Edition cards hearken back to prior days of 1E, with fresh cards for some popular old decks. So say happy holidays and peldor joi, and spread good cheer with the Warp Pack: Holiday 2017! A Virtual Expansion released on 2016-09-30, containing 18 new 1E cards. Over the course of the last fifty years, Star Trek has told some amazing stories, and that's the focus of Star Trek 50: First Edition. You won't find a single personnel or ship in this product, but you will find eighteen (18) new dilemmas, incidents, objectives, and more designed to capture some of Trek's most famous moments. Celebrate five decades of wonder with Star Trek 50: First Edition. 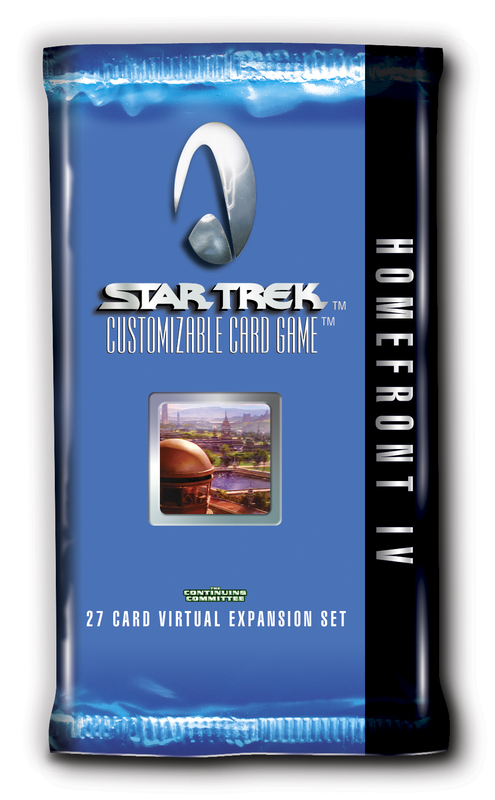 A Virtual Expansion released on 2015-05-29, containing 48 new 1E cards. The Star Trek: Customizable Card Game universe gets a whole lot bigger with Homefront VI, the first Core Block expansion built from the ground up with Block play in mind. Forty-eight (48) newly printable cards combining the old with the converted, focused on adding new and exciting dilemmas to the mix. A Virtual Expansion released on 2015-01-30, containing 56 new 1E cards. The Continuing Committee is proud to bring the Deep Space 9 block to a close with The Gamma Quadrant – a fifty-four (54) card First Edition virtual expansion that focuses on the dangers – and opportunities – beyond the Bajoran Wormhole. Take command of the monolithic Dominion as they manage their sprawling empire preparing for war; or, negotiate foreign lands as you seek to explore, exploit or conquer The Gamma Quadrant! A Virtual Expansion released on 2014-11-28, containing 19 new 1E cards. 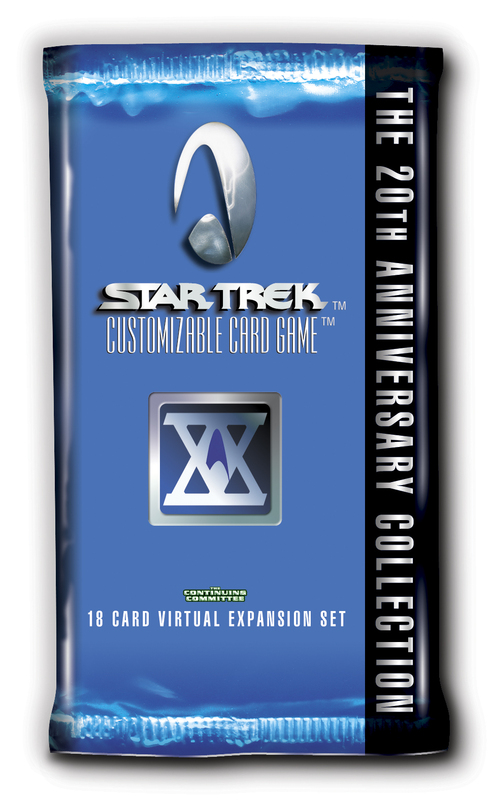 Relive twenty years of the Star Trek Customizable Card Game with The 20th Anniversary Collection, a special eighteen (18) card celebration of First Edition’s history. Featuring cards inspired by many of the most famous Decipher-era products, everyone will find a way to relive old memories and build new ones as the games begin their third decade! 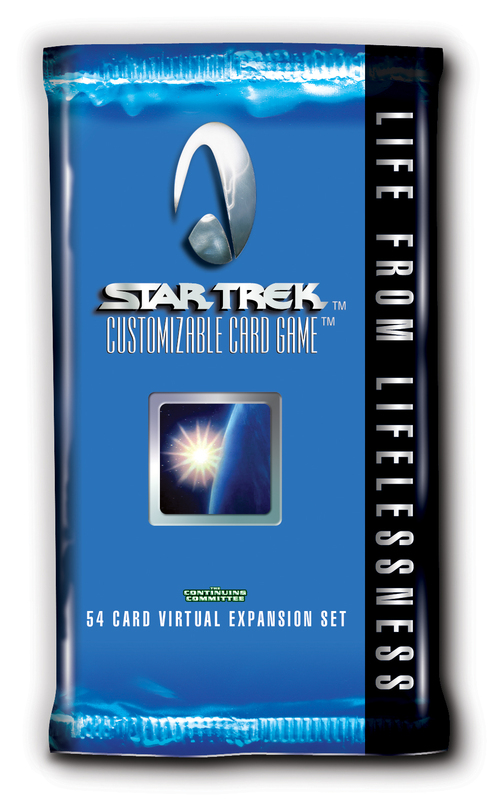 A Virtual Expansion released on 2014-06-27, containing 58 new 1E cards. 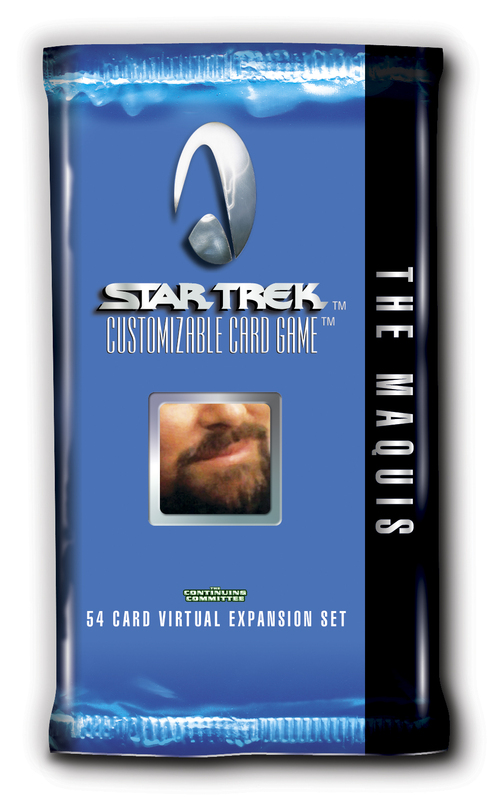 The Continuing Committee is proud to bring you The Maquis – a fifty-four (54) card First Edition virtual expansion that finally brings real meaning to the icon first released sixteen years ago. Players may now build decks based on Maquis active before the Dominion War, the lost crew abducted by the Caretaker in the Delta Quadrant, or inclusive of all members from any Maquis cell. There are also cards that make staying in a region – or staying out of a region – an important decision. A Virtual Expansion released on 2014-04-11, containing 6 new 1E cards. It's time to boost your decks with Warp Pack: Emissary, featuring six (6) new cards as part of the Deep Space 9 block. No matter if you use these cards to defend your station, commune with the Prophets, or staff your flagship, players all across the world will enjoy the new cards in this new First Edition virtual expansion! A Virtual Expansion released on 2013-12-06, containing 18 new 1E cards. 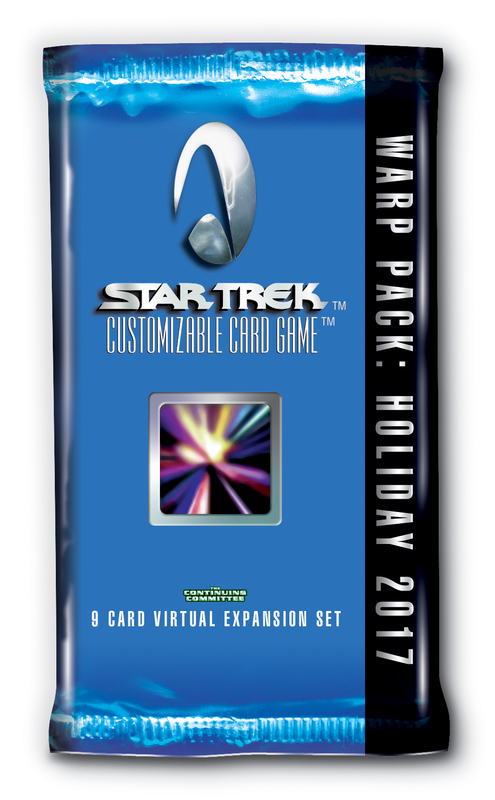 A Virtual Expansion released on 2013-12-06, containing 80 new 1E cards. A Virtual Expansion released on 2013-12-06, containing 85 new 1E cards. Reshape the Alpha Quadrant and venture beyond the Bajoran Wormhole with Emissary, an eighty-one (81) card expansion kicking off the new Deep Space 9 block. Join the crew of the station as they stave off Cardassian interests and explore the Gamma Quadrant. With both new and familiar faces, everyone can find something new to enjoy in this First Edition virtual expansion! A Virtual Expansion released on 2013-08-16, containing 27 new 1E cards. 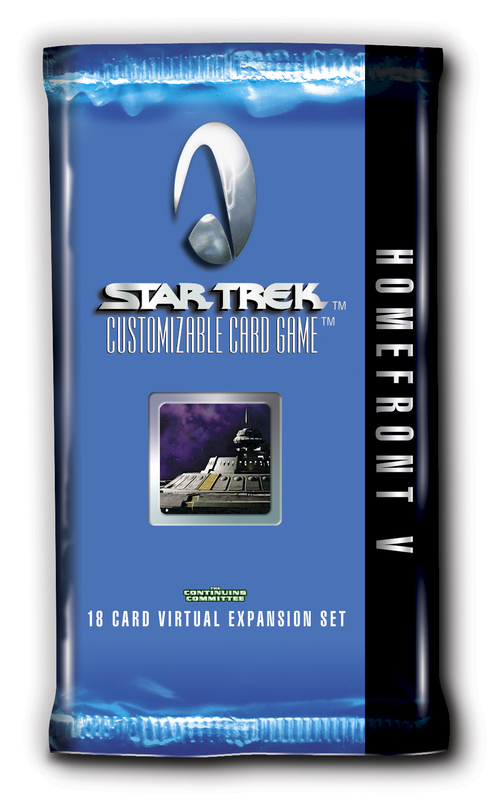 The Star Trek: Customizable Card Game universe gets a whole lot bigger with Homefront IV, the latest core expansion to join the First Edition card pool! Twenty-seven (27) newly printable cards - including two dozen missions - combine the old, the converted, and the new into an exciting collection sure to bring new challenges and new opportunities to your favorite decks. 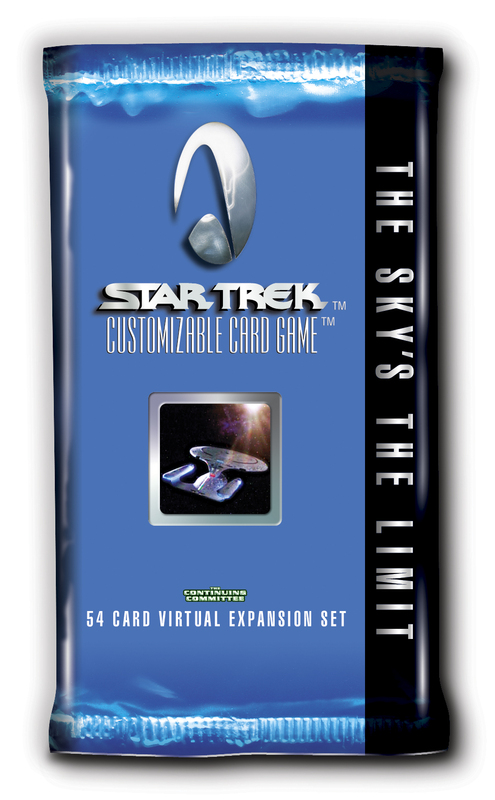 A Virtual Expansion released on 2013-04-26, containing 55 new 1E cards. 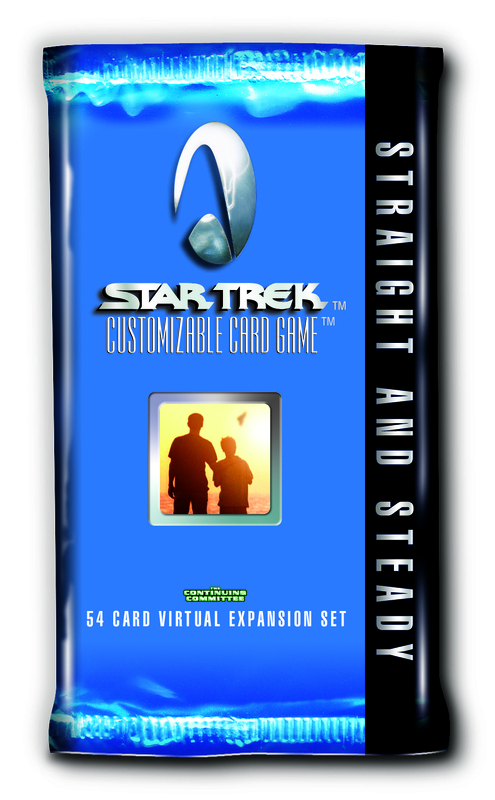 A Virtual Expansion released on 2012-11-02, containing 54 new 1E cards. A Virtual Expansion released on 2012-09-07, containing 36 new 1E cards. New conversions join old staples in Homefront III, the 2012 reprint expansion that adds thirty-six (36) cards to the First Edition virtual pool and offers new opportunities to spice up play in every tournament format! Featuring alternate image versions of hard to find cards and staple reprints for block play, veteran and new players alike will all find something to enjoy within. A Virtual Expansion released on 2012-04-13, containing 45 new 1E cards. 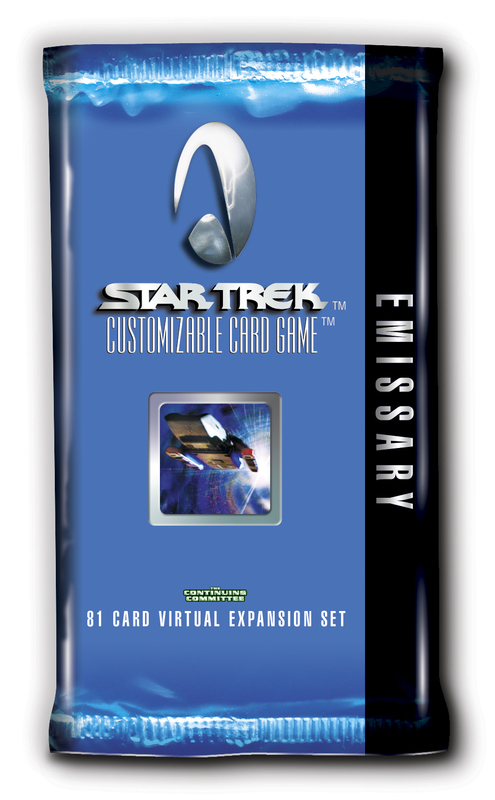 A Virtual Expansion released on 2012-04-13, containing 102 new 1E cards. Rediscover your love of The Next Generation with this ninety-nine (99) card expansion, designed for new and veteran players alike. Celebrate 25 years of TNG with new faces, returning favorites, and brand new decks for the Federation, Ferengi, and Klingons. Explore the galaxy and "boldly go where no one has gone before" with this new First Edition virtual expansion! A Virtual Expansion released on 2011-11-22, containing 18 new 1E cards. The Continuing Committee is proud to release Resistance is Futile: The First Contact 15th Anniversary Collection to celebrate the film’s 1996 release with eighteen (18) new First Edition cards. It’s time to renew the battle to save the Federation: will you help Picard and crew Launch the Phoenix before the Borg manage to disrupt the timeline and Stop First Contact. A Virtual Expansion released on 2011-08-06, containing 54 new 1E cards. 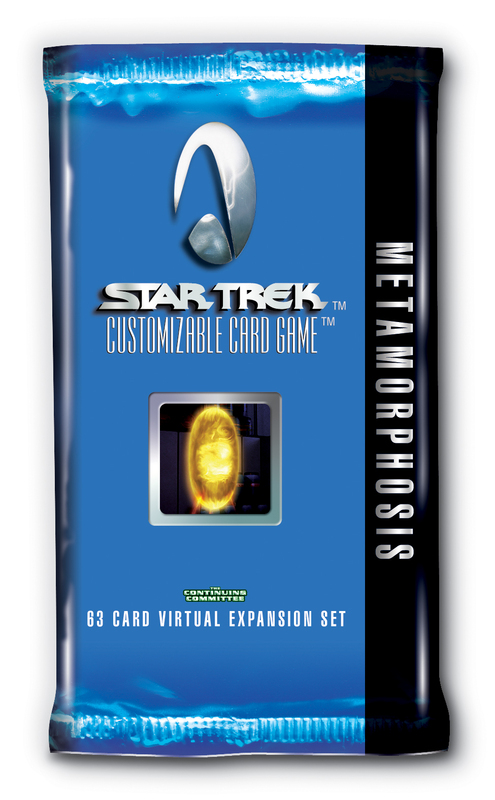 A Virtual Expansion released on 2011-04-15, containing 55 new 1E cards. A Virtual Expansion released on 2011-04-01, containing 36 new 1E cards. A Virtual Expansion released on 2010-10-22, containing 57 new 1E cards. A Virtual Expansion released on 2010-08-06, containing 36 new 1E cards. A Virtual Expansion released on 2010-06-11, containing 54 new 1E cards. A Virtual Expansion released on 2009-11-06, containing 15 new 1E cards. Return to the game's humble beginnings with Chain of Command, part of the 15th Anniversary Collection. Featuring new ships and their commanders for the original three affiliations - Federation, Klingon and Romulan - Chain of Command spans the entire history of the Star Trek universe and brings the first virtual expansion to First Edition. A Virtual Expansion released on 2009-04-14, containing 235 new 1E cards. The Introductory Promo Cards are 1 VP through 7 VP and are available as a single download. The Rotation Damage Markers (10 VP through 18 VP) are available in a single PDF file. Virtual Promo cards 19 VP through 33 VP are part of the 15th Anniversary Collection known as Things Past. A Virtual Expansion released on 2009-01-05, containing 25 new 1E cards. A Virtual Expansion released on 2008-11-19, containing 31 new 1E cards. 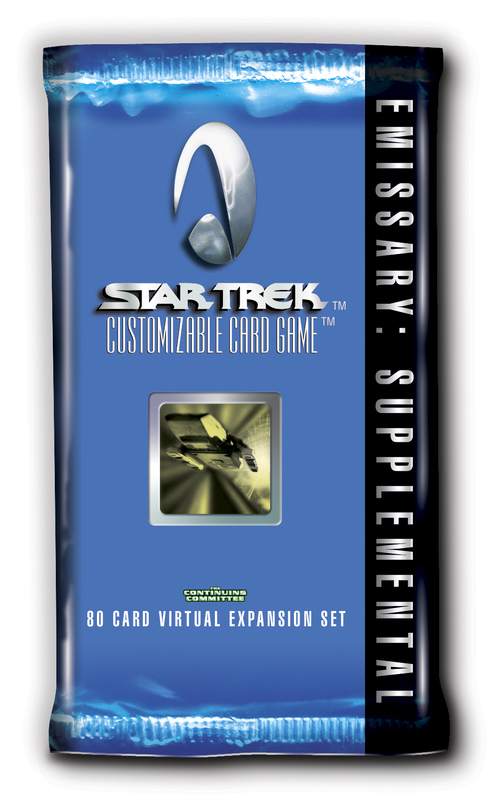 A Physical Expansion released on 2006-07-07, containing 18 new 1E cards. A Physical Expansion released on 2003-07-16, containing 41 new 1E cards. The longest-anticipated set in Star Trek CCG history. All those tantalizing references on earlier cards will finally be realized in All Good Things, a limited-edition set that will mend all the "broken links" of First Edition. A Physical Expansion released on 2002-04-17, containing 134 new 1E cards. Star Trek CCG heads to the movies, with a brand-new expansion set featuring cards from all nine of The Motion Pictures! Villains from Khan to Chang to Ruafo, perils from V'Ger to Genesis to the Nexus... Starfleet's finest are out saving the galaxy from them all. Whether saving the whales or searching for Sha Ka Ree is your idea of a good time, you'll find it in Star Trek CCG: The Motion Pictures. Even the Voyager-only format is supported, with cards from theVoyager episode "Flashback" tying in to Star Trek VI: the Undiscovered Country. The 131 cards are packaged in display boxes of thirty booster packs, each containing one rare card and a mix of 10 common and uncommon cards. A Physical Expansion released on 2001-12-21, containing 141 new 1E cards. The expansion set that Star Trek CCG fans have been waiting for since 1995 is here!! Yes, Holodeck Adventures is in stores now, featuring cards from all your favorite holodeck episodes, from Dixon Hill and the town of Deadwood to Secret Agent Julian Bashir and Captain Proton. Holographic personnel and equipment, holodeck "personas" of main characters, and other holodeck-themed cards are complemented by new Delta Quadrant missions, Q-icon cards, and many long-awaited "broken links." Like other recent expansions, this 131-card set consists of 40 common, 40 uncommon, 50 rare, and one ultra-rare card. It is packaged in display boxes of thirty 11-card packs, each containing one rare card and a mix of 10 common and uncommon cards. A Physical Expansion released on 2001-09-19, containing 143 new 1E cards. The Borg is the perfect companion set to the popular Voyager expansion. 131 cards include new Borg personnel and ships, a new Hirogen affiliation, new cards for the Vidiians, Kazon, Federation, and other affiliations, additional Delta Quadrant missions, and new dilemmas, objectives, and other cards to enhance your Voyager, full environment, and Warp Speed format decks. 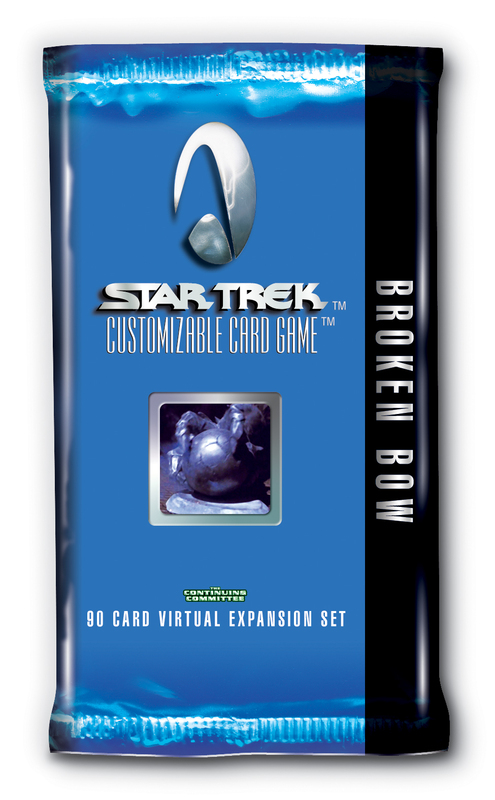 A Physical Expansion released on 2001-05-23, containing 218 new 1E cards. Voyager, the tenth expansion set for the Star Trek Customizable Card Game, takes you to the Delta Quadrant for new dimensions of gameplay. 201 cards include the U.S.S. Voyager and its crew, new Kazon and Vidiian affiliations, dual-affiliation cards with different border colors highlighting the different affiliations, dozens of new missions and dilemmas, 30 selected commons and uncommons from other sets updated with all-new Voyager images and lore, and much more. Fully compatible with all existing Star Trek CCG cards, Voyager also supports a Voyager stand-alone environment and both sealed deck and constructed deck Voyager Warp Speed formats. A Physical Expansion released on 2000-12-06, containing 131 new 1E cards. Included in the set's 131 cards is the ultra-rare First Officer Spock, a handful of Rare+ cards (33% more rare than rare), and a distribution of Rare, Uncommon and Common cards, similar to other Star Trek CCG sets. In Mirror, Mirror, you'll find more personnel per capita than in any previous Star Trek CCG set, including the "mirror personae" of TOS and Deep Space Nine personnel who've entered the Mirror Universe. A Physical Expansion released on 2000-11-01, containing 21 new 1E cards. The 21 new premium cards of Enhanced Premiere introduce dual Personnel cards, combined Dilemmas, and Mission II cards with outposts. Plus, built-in speed up rules - like playing two cards per turn instead of one. It's a good bet for great gaming. Double down. A Physical Expansion released on 2000-10-18, containing 105 new 1E cards. A Physical Expansion released on 2000-08-09, containing 27 new 1E cards. Two starter decks containing old cards reprinted with hidden tribbles in the images. A Physical Expansion released on 2000-08-09, containing 141 new 1E cards. A Physical Expansion released on 2000-03-15, containing 6 new 1E cards. Each buff, sturdy, 800 card Second Anthology box packs 2 Starter Deck II's, plus 2 boosters each from First Contact, Deep Space Nine & Dominion. You'll find a new version of Dax plus five more Premium black-border cards found only in Second Anthology. A Physical Expansion released on 2000-02-29, containing 1 new 1E cards. This card was inserted into the PC game, Star Trek: Armada by Activision as a promotional tie-in. Also included in All Good Things boxed set. A Physical Expansion released on 1999-12-01, containing 130 new 1E cards. Introduces the Ferengi affiliation in a 130-card set that transforms Star Trek CCG tournament scene because it includes potent antidotes to decks built around Black Hole, Q-Bypass, bonus points, Computer Crash, Anti-Time Anomaly, Red Alert, Rogue Borg Mercenaries, Visit Cochrane Memorial, and more. The set of 130 cards contains 50 Rare, 40 Uncommon and 40 Common cards, sold in 9 card booster packs. A Physical Expansion released on 1999-08-18, containing 130 new 1E cards. A Physical Expansion released on 1999-01-20, containing 134 new 1E cards. Introduces the Dominion affiliation in a 130-card Limited expansion. Plus four special white-border preview cards that preview cards in future Star Trek CCG expansions. Included in the four preview cards are Seven of Nine and Captain Kirk. A Physical Expansion released on 1999-01-13, containing 12 new 1E cards. Enhanced First Contact (EFC) introduces the next evolutionary step for the Borg and for First Contact expansion. 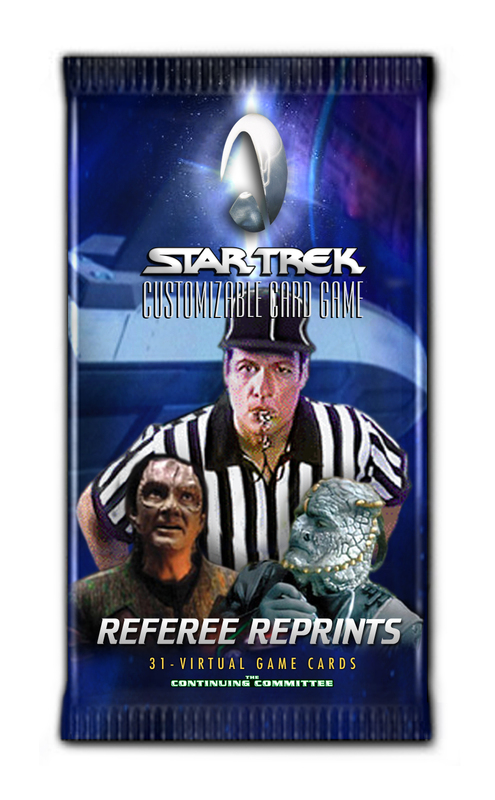 Four different EFC packages will contain 3 different new black border premium cards and one transparent Borg overlay gameplay device, plus four packs of First Contact limited edition cards. The three premium cards in each package are not randomized, so each group of three will always occur together in the same package, along with the same transparent Borg overlay. The Enhanced First Contact package design will have a die-cut front, revealing the lead card, so you will always know which three premium cards are within. In addition, a list of all twelve cards, in their groups of three, is printed on the back of each and every package. Each of the four Enhanced First Contact packages contains a different new Incident card as one of its three premium cards. All 12 new cards are Borg-related. A Physical Expansion released on 1998-12-16, containing 8 new 1E cards. Decipher re-releases a core product of Star Trek CCG, the Premiere starter deck, with a new Premiere rule booklet (version 1.1, including all Premiere rules updates to present), and including 8 new cards specially designed for Starter Deck II. Each of the new Premiere Starter Deck II packs will contain 60 randomized white bordered unlimited edition cards from the original 363-card Premiere set (2 rare, 13 uncommon and 45 common), 8 fixed black bordered new limited edition cards, and the Premiere (version 1.1) rule booklet. A Physical Expansion released on 1998-07-23, containing 277 new 1E cards. This double size set of 276 cards (plus the U.S.S. Defiant, a special "twice as rare" white-border card previewing a ship in The Dominion expansion) will introduce the characters, aliens, settings and situations of the popular Star Trek: Deep Space Nine television series. 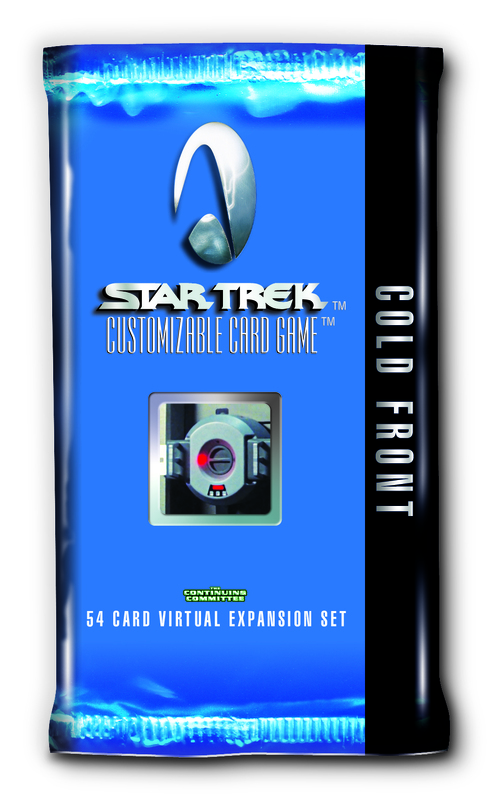 The cards of this set will be fully compatible with existing Star Trek Customizable Card Game product. Cards will be sold in 9-card expansion packs and in playable 60 card starter decks. This set will bring in new gameplay concepts such as the Bajoran wormhole, Gamma Quadrant and the Cardassian and Bajoran affiliations. A Physical Expansion released on 1998-05-14, containing 20 new 1E cards. The Official Tournament Sealed Deck will contain everything needed for challenging and well-balanced play. Each and every set will contain the same fixed deck of twenty new black border cards, including doorways, outposts, ships and personnel. Also included in each set will be four Premiere (white border) expansion packs and one Alternate Universe expansion pack. The basic set is presented in six different box designs (each representing an affiliation). The box is sized to hold 300 cards unsleeved, 150 cards in protective sleeves, or three 50-card hard plastic boxes. A Physical Expansion released on 1998-05-01, containing 2 new 1E cards. This pack contains two cards featuring The Traveler and The Emissary. These have been designed to honor Decipher's Star Trek CCG traveling game evangelists who went by those pseudonyms. These packs were made available in an issue of Scyre magazine and were handed out by the traveling evangelists themselves. The "evangelists" technically known as Product Managers were Marcus Certa (The Emissary) and Kyle Heuer (The Traveler). A Physical Expansion released on 1997-12-31, containing 18 new 1E cards. Each copy of The Fajo Collection set contains 18 super-rare cards designed to enhance the value and playability of all other cards of the Star Trek CCG universe to date. Each set contains these extraordinary elements: a presentation binder, a signed Certificate of Authenticity, a Fajo Collection rules document, a collectible art poster showcasing the entire Star Trek CCG universe to date. You'll also find a $50 rebate voucher towards purchase of uncut sheets of white border Premiere cards. This first-edition printing is limited to 40,000 copies. A Physical Expansion released on 1997-12-17, containing 130 new 1E cards. 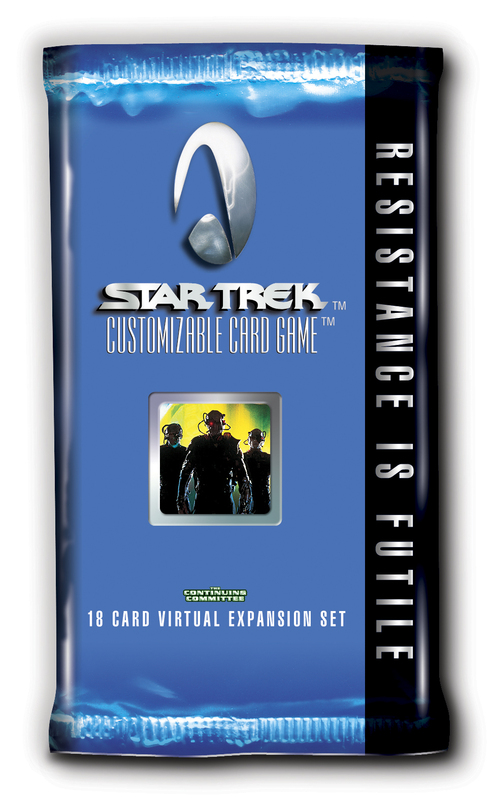 The 130 cards of Star Trek Customizable Card Game First Contact introduce a new affiliation, The Borg, enhanced personnel battling and other gameplay innovations, including Objective cards and new deck sizes (the 30/30 Rule). Sold in expansion packs of nine cards each. A Physical Expansion released on 1997-06-01, containing 6 new 1E cards. 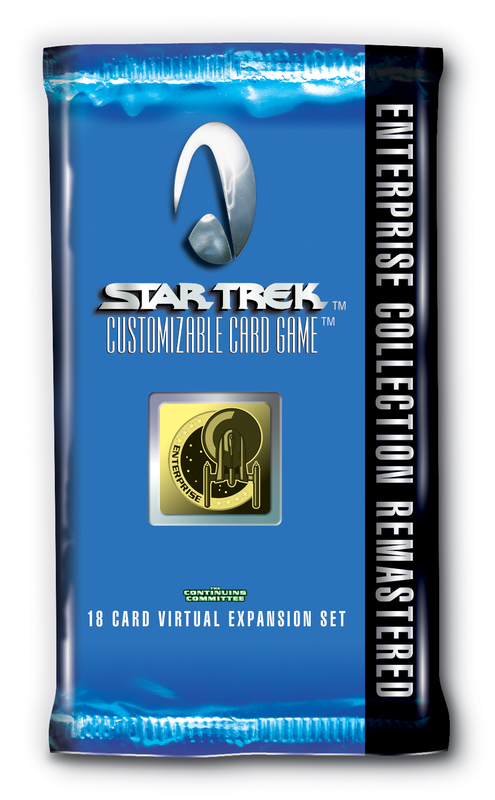 Each Star Trek Customizable Card Game First Anthology set contains two white border Premiere 60-card starter sets, two 15-card packs of white border Premiere, two 15-card packs each of black border Alternate Universe and Q-Continuum. You'll also get the premium (and preview) white bordered Warp Pack. A Physical Expansion released on 1997-01-01, containing 21 new 1E cards. Each and every game set contains two pre-customized 60-card decks, one Federation, one Klingon, both of which are white-bordered. 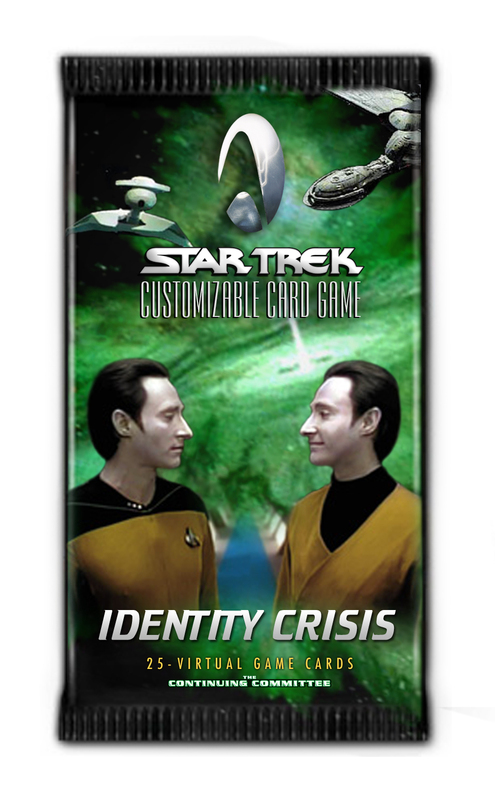 In addition, each includes the same 3 premium cards (a black-bordered Admiral McCoy and Data Laughing and a white-bordered Spock) and 11 new white-bordered mission cards. The two-player game is published in two distinct editions. Edition #1 (blue box) contains a set of three new black-bordered premium Federation cards, the same in every set. Edition #2 (red box) similarly contains a set of three new black-bordered premium Klingon cards. A Physical Expansion released on 1996-10-01, containing 121 new 1E cards. The Q-intessential expansion set of 121 cards brings to life the irrepressible personality of the elegant prankster, Q. Prepare yourself for fun as this endearing entity throws you into one improbable situation after another in his quest to keep himself entertained, and you, the players, guessing. Open the door to the Continuum and watch these cards warp reality. Your strategies and game plays will never be the same. A Physical Expansion released on 1995-12-08, containing 122 new 1E cards. The 122 cards of Star Trek: The Next Generation CCG(TM) Alternate Universe introduce the idea of opening "doorways" to other dimensions. Experience time travel, parallel universes and alternate timelines. Play blackjack at the Royale Casino. Attempt a new dimension of missions. Contains the ultra-rare Future Enterprise...use it to travel to the ends of your spaceline at warp speed. You can even find Data's Head! This set expands the game play into surreal worlds and different phases of existence. A Physical Expansion released on 1994-11-10, containing 363 new 1E cards. The 363 cards of the Premiere Edition contain a galaxy of characters and story elements from all seven seasons of Star Trek: The Next Generation television series. They are sold in starter decks of 60 cards each, or in expansion packs of 15 cards each. The cards of this edition introduce the ships, crew members, aliens, defenses and missions that players love best. They provide each player with a solid foundation from which to "expand his power in the universe."